Westbourne Grove Church has slots reserved on Fridays and weekends for children’s party bookings. Our Main hall (main hall and kitchen) we have seating for 40 children. We are unable to host birthday parties in our small hall suite due to unsuitable noise levels and complaints from our neighbours. 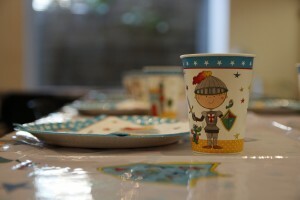 Our party slots are about 4 hours long and include set up and clear up times. The prices vary according to different midweek rates and different morning and afternoon rates. Usually the hire time is from 2pm to 6pm in the afternoons which includes your set up and clear up time. 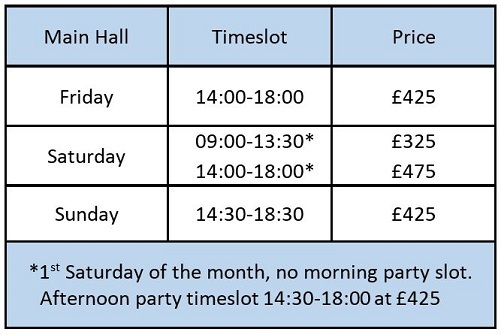 We are a dry hire venue but do offer tables and chairs. Please look at our Party Booking Terms and Conditions and Suitable Use Policy to make sure your party would not conflict (No ball games, no loud music parties). Due to noise level requirements stated in our terms and conditions only our sound equipment may be used in the building. Please be sure to inform your entertainers of this. Details of sound systems the church can make available to you can be found here.